Weds 29 August: with Shanthi Sivansen to the Haymarket Odeon, to see Take This Waltz. Very much a film to see with a person of the opposite gender for the conversation afterwards. I think the male roles in the love triangle are deliberately underwritten, in order to properly focus on the feelings of the main character, played by Michelle Williams. Somewhere between indulgence and catharsis – and it just about works. 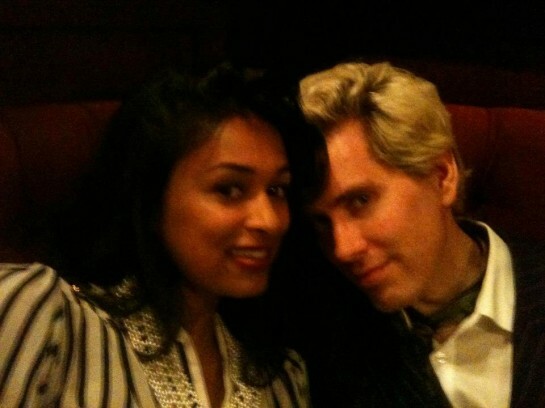 Here’s a photo of Ms S and myself taken a few weeks ago, when we saw another US indie relationship three-hander flick, Your Sister’s Sister (also very enjoyable). This was in Bradley’s Bar in Hanway Street, at a point where I’m probably about to fall over. Thurs 30 August: To the Ketchum Pleon building in Folgate St for the private view of Sadie Lee’s Transformers show. Large portraits of people like Holly Woodlawn, David Hoyle and Rita Tushingham. Her subjects are often aging, but with their lined faces used in a sense of queer defiance, a little in the spirit of Derek Jarman (of which more below). Fri 31st August: Seaneen Molloy’s and Robert V’s wedding reception, at The Cambria in darkest Camberwell. Many old faces there too. I overdid the drinking on Thursday, and feel bad that I am not on sparkling form for the reception. I have to learn – I can only cope with one big night out a week, alcohol wise. Highlight for me: Seaneen singing the Magnetic Fields’ ‘The Book Of Love’. Sunday Sept 2nd: Scones at High Tea with Ella Lucas. Ella gives me a lovely birthday present – a pair of seahorse cufflinks. I have my hair cut and re-bleached. Far too short as usual, which makes me think of a line in a Wendy Cope poem somewhere… ‘husbands coming back from the hairdressers looking like convicts’. Like my 40th, I spend my 41st birthday on another day trip to somewhere I’ve not been before, giving my eyes new sights to see. I wanted to go somewhere involving the sea, trains, history, inspiration, and where I could be back home by the evening. 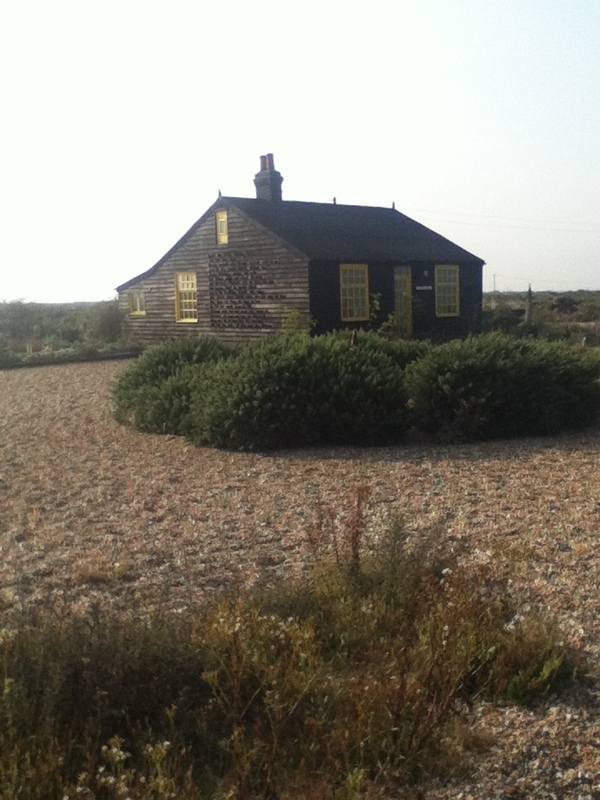 Derek Jarman’s garden at Dungeness was long overdue for me. Reading the Peake biography, I’m fascinated by the way Jarman was not quite the revered icon I thought he was during his lifetime: even other gay activists gave him a hard time. That in 1991 he protested against Ian McKellen’s acceptance of a knighthood, as it looked like selling out to the government that had brought in Clause 28. The same year he called for a boycott of the Guardian after it ran an article about certain gay lifestyles being dangerous – even though it was written by an AIDS sufferer. It seems easy to forget that passions ran so high and so divisively in those years when the virus was new and seemingly unstoppable. He says somewhere that one reason the Dungeness garden was his greatest hit, away from the films and books and paintings and music videos, was that it was ongoing, and therefore critic-proof. It was never properly a work on show. There was never a private view, a launch, a press release, a review copy. It was never officially open to the public, yet never officially not public (fishermen’s cottages rarely being fenced off, by design). It was just known to have begun. Today, Collins is still the current owner and gardener. There is a small sign on the front door, identifying the cottage as Jarman’s, and respectfully asking visitors to not look in the windows or take photographs for commercial use without permission. The ‘solitude and silence’ is not much in evidence when I arrive, mind – daytrippers are everywhere, packing out the Light Railway Cafe, the Britannia Pub and the beach itself. There are a few other artist’s gardens in the area too. It’s not quite St Ives, but Mr J’s influence on the neighbouring huts is unmistakeable: wind-proof arrangements of found objects, carefully arranged in the shingle. A day of different trains: Northern Line tube from Highgate to Kentish Town, short-cut overground rail to St Pancras, then High Speed state-of-the-art HS1 train to Folkestone, being the currently renamed ‘Javelin’ train due to it serving the Olympic Park at Stratford East. Then a 20 minute bus from Folkestone to Hythe, in order to take the 1920s miniature steam railway to Dungeness via New Romney. Thirteen and a half miles at over an hour. The fastest train in the country followed by what must be one of the slowest – and pleasingly so. Though there’s no shortage of photographs online of Jarman’s cottage, I think I can add something rarer. A photo of Derek Jarman’s post box, on the road close to the cottage. 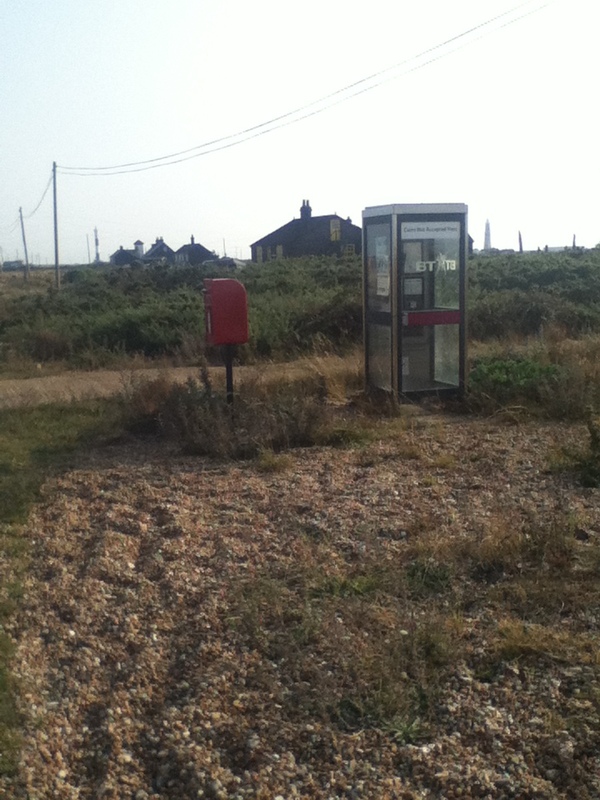 It’s the only post box in Dungeness, and Jarman mentions it in his book on colour, Chroma, in the section on red. Its redness really does stand out in the landscape, too. In this pic you can just about make out the two lighthouses in the distance, either side of Mr J’s cottage, pictured here in the centre. A day, then, of things I like at the age of 41: train trips, cafes, exploratory walks, beach vistas, flowers, places with creative history, and remote post boxes. I make sure I use the post box, too: one aerogramme to Danika H in Australia, one postcard of an old Dungeness railway poster to Mum and Dad, another to Aunt Anne and Uncle Keith in St Ives. All written over a mug of tea with scampi and chips in the Light Railway Cafe, where Jarman used to have lunch. I take the last steam train of the day back to New Romney, then a bus to Ashford, and then the Javelin to home. A woman at St Pancras stops me to compliment me on my seahorse brooch. 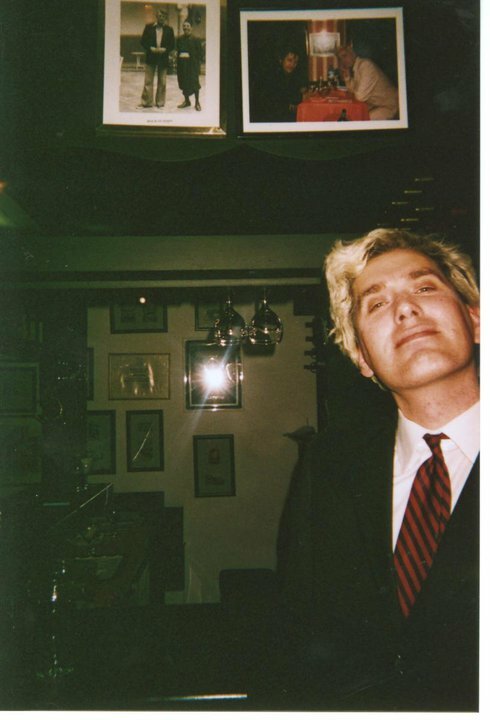 And today I notice that, in the photos in the final collection of Jarman’s diaries, Smiling In Slow Motion, his partner Keith has a seahorse tattoo on his arm.